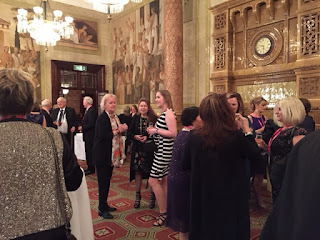 On Monday, I headed down to London for the Romantic Novelists’ Association Annual Awards, the RoNAs. I didn’t know what to expect, as I hadn’t attended before. By chance, although getting on at different stations, my friend Bella Osborne was on the same train. 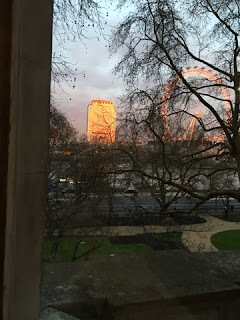 We travelled together to the hotel near Embankment tube station right by the River Thames. We were pleasantly surprised to find the hotel we had booked into was right next to the venue for the evening at One Whitehall Place. We later discovered there was a very welcome connecting door, so we didn’t even need coats! 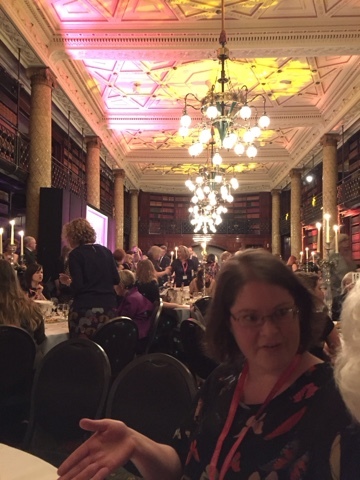 I had decided to attend the awards as several of my friends, Bella Osborne, Janice Preston and Alison May, were nominated for awards, as well as others I know and admire from the RNA. The evening began with a champagne reception in a beautiful room overlooking the Thames. It almost felt as if the buildings and the London Eye on the opposite bank had been lit just for us. Noise levels, as at most RNA events, were heightened as friends greeted each other and new friendships were made. We were ushered through into the Gladstone Library, where our seating was pre-allocated at glittering tables loaded with canapes, silver chocolate hearts and pink champagne. 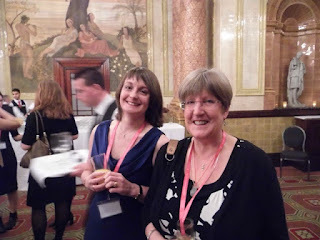 I was sitting opposite to Sue Moorcroft and next to June Tate. 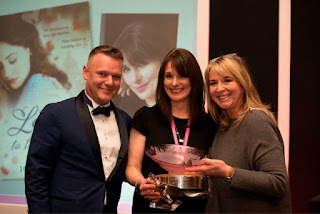 Fern Britton was presenting the awards, along with the RNA’s own Jane Wenham-Jones. My friends unfortunately didn’t pick up any prizes, but it was a great achievement to be shortlisted anyway. Anita Burgh is the author of twenty-three novels, all published after she reached 50. Claire Lorrimer, who has written more than 100 novels, is the daughter of the RNA’s first President, best-selling novelist Denise Robins. Both Anita and Claire were presented with outstanding achievement awards for their continued championing of the RNA and romantic fiction. 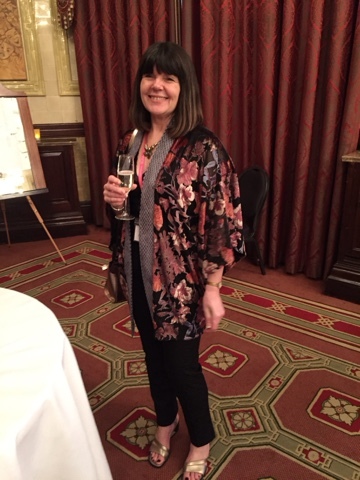 Iona Grey triumphed over fellow competing authors to win the Romantic Novelists’ Association’s highest accolade, The Goldsboro Books Romantic Novel of the Year, with Letter to the Lost, published by Simon & Schuster. Fern Britton presented Iona with her trophies and a cheque for £5000. 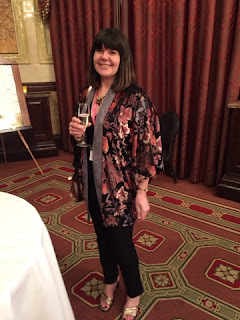 I have a particular soft spot for Iona Grey, as I once attended one of her courses about heroes and heroines in Cheshire and she has taken an interest in my writing ever since. What a wonderful event. I want to book for next year already. It was a very special evening, Sally. I enjoyed myself immensely.